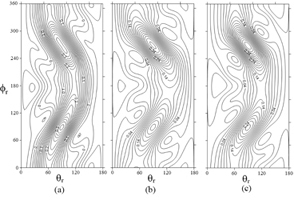 Theoretical study of stereodynamics for the reaction of F+CH4→HF+CH3 has been carried out with quasiclassical trajectory method (QCT) on a new potential energy surface (PES) structured with the London-Eyring-Polanyi-Sato (LEPS) model. Integral cross sections (ICS), differential cross section (DCS), and product rotational angular momentum polarization have been calculated. The calculated ICS is in good agreement with earlier experimental result especially at the collision energy under 2.5 kcal/mol. The DCS result shows that the F+CH4→HF+CH3 reaction is a typical backward-scattered reaction. The influence of collision energy on the P(θr) distribution at lower energy (1.0 to 3.0 kcal/mol) is more sensitive than that at higher energy (3.0 to 5.0 kcal/mol). With the increasing collision energy, the polarization of P(Φr) distribution is enhanced. F+DCH3→DF+CH3 and F+TCH3→TF+CH3 reactions are studied at 3.0 kcal/mol to discuss the isotopic effect. The P(θr) distribution is not sensitive to mass factor, but the polarization of P(Φr) distribution is enhanced when the mass factor gets larger.